Compare hot cross buns from Costco, IGA, Woolworths, Coles and ALDI on taste, value for money, freshness, variety and overall customer satisfaction. 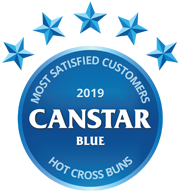 Costco has toasted the competition in Canstar Blue’s hot cross bun ratings, scoring five-star reviews on taste, value for money, freshness, variety and overall satisfaction. It got a solid four stars on value for money. Where can you find the best hot cross buns in 2019? There’s almost nothing that compares to the sweetly spiced aroma of hot cross buns toasting away in the morning. And whether you agree with the supermarkets selling them in December or not, nothing says Easter like a hot cross bun smothered in your favourite butter or margarine. As the supermarkets point out, many Aussies love buying their buns months ahead of the Easter holidays, giving consumers plenty of time to decide which chain bakes the best. 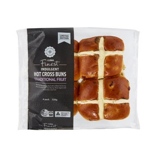 Therefore, we at Canstar Blue thought it was about time to test Australia’s tastebuds to find out which supermarket chain is deemed to offer the best hot cross in 2019. Not only did Costco secure five stars for overall satisfaction, it also got top marks on taste, freshness and variety, with four stars on value for money. Lots of Aussies love hot cross buns – and it seems they come best in bulk! IGA got four stars for overall satisfaction, while the rest were left on three stars. However, ALDI was the only brand to receive five stars on value for money. Let’s now see what each supermarket has to offer before we dive into some of the standout findings from our survey of shoppers. Wholesale retailer Costco is well-known for its bulk buys, even when it comes to hot cross buns. It offers just one Traditional Fruit option in a 24 pack that could last you for days! Costco was a clear winner in the buns war, scoring five stars on taste, freshness, variety and overall satisfaction. It also got four stars on value for money. The Independent Grocers of Australia (IGA) offers its Baker’s Oven Easter buns, which can be purchased individually or in packs of six. The chain got four stars for overall customer satisfaction, as well as variety. It scored three stars in all other categories, including taste, value for money and freshness. Woolworths has gone beyond the traditional and added various new tastes to its range in 2019. Its hot cross buns are available in four and six packs, with different flavours on offer including Banana & Caramel, plus White Chocolate & Raspberry. It also sells brioche style hot cross buns. Woolies got three stars for overall satisfaction as well as for taste, value for money and variety. It achieved four stars on freshness. Coles has one of the largest ranges on offer, including traditional fruit, fruit free, apple & cinnamon, chocolate and gluten free. There are also mini and jumbo options available, plus Coles’ Finest Indulgent range, which includes Belgian Chocolate & Cherry, plus Sticky Date & Butterscotch varieties. Buns come in packs of up to nine. Coles rated three stars for overall satisfaction, as well as value for money and variety. It was four stars for taste and freshness. ALDI was also quick to bust out its hot cross buns this year, with a variety of flavours on offer. It has fruit and fruitless varieties in six packs, plus mini chocolate chip and mini fruit hot cross buns in packs of nine. Its Specially Selected Brioche range comes in original and chocolate chip, which come in packs of four. ALDI got three stars for overall satisfaction and most other variables, but was the only brand to get five stars on value for money. While there’s plenty of new and exciting flavours that supermarkets are trying out, it seems nothing can beat the classic. Are hot cross buns sold too early in supermarkets? This controversy appears to divide the generations, with a majority of over 60s (55%) more likely to say supermarkets sell hot cross buns too early, while the youngsters (aged 18 to 39) are much less likely to object (27%). 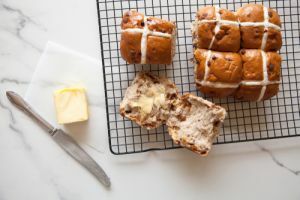 Interestingly, the hot cross bun debate seems to parallel with the sale of Easter chocolates, with 56% of over 60s agreeing that they’re sold too early, as opposed to only a third (32%) of those aged under 40. How do you have ‘em? There are many ways to eat a hot cross bun and plenty of different recipes to try with them, like a hot cross bun croquembouche or pudding. But nothing beats a spread of butter, or just plain toasted. Canstar Blue surveyed 3,000 Australian adults across a range of categories to measure and track customer satisfaction, via ISO 26362 accredited research panels managed by Qualtrics. The outcomes reported are the results from customers within the survey group who have purchased and eaten supermarket branded hot cross buns in the last month, in this case, 1,057 people.